DOCTOR WHO: Looking back at Pyramids Of Mars | Warped Factor - Words in the Key of Geek. Time now to head back to ancient Egypt as we look at the culture of the land of the Pharaohs as shaped by the Osirians, according to Pyramids Of Mars! Eminent archaeologist Professor Marcus Scarman is excavating a pyramid when he comes across the symbol of the Eye of Horus. Here, the Eye is shown to be part of Sutekh's Earthly prison, having been sealed inside by his brother following the destruction of their home planet of Phaester Osiris. Horus was said to be representative of Upper Egypt, while Sutekh/Set fulfills the same function for Lower- the country/kingdom divided until the Pharaoh Menes unified it around 300BC, becoming the first ruler of what is known as the First Dynasty. Sutekh is not his only name- he's also recorded in Egyptian myth as Set, Seth, Setekh, & the Typhonian Beast ( '' You know, the Egyptians called him the Typhonian Beast.'') among others! His physical appearance as depicted by those who no doubt feared him is the basis for how he looks as first glimpsed through the time-tunnel hidden in a sarcophagus ( one of the many forms of Osirian technology said to have inspired Ancient Egyptian culture) at the Scarman house, the old priory which will one day become UNIT HQ! Whatever you may care to call him he was bad...well, as god of disorder & violence he'd have to be, you'd think! He was also associated with the desert, & married his sister Nephthys, who features in the Fifth Doctor novel The Sands Of Time, a prequel/sequel to Pyramids Of Mars- a common custom in Egypt at the time as such unions were thought to keep bloodlines pure. Once freed he will bring his gift of death with him, taking control of Marcus's body having reanimated it following his initial death! Among his other powers were physical projection & telepathy, which of course he uses for evil, inflicting great pain upon the Doctor during their meeting in the aforementioned pyramid prison. Perhaps another famous example of their influence on the Pharaohs & the people they ruled is their service robots, which take the form of mummies. 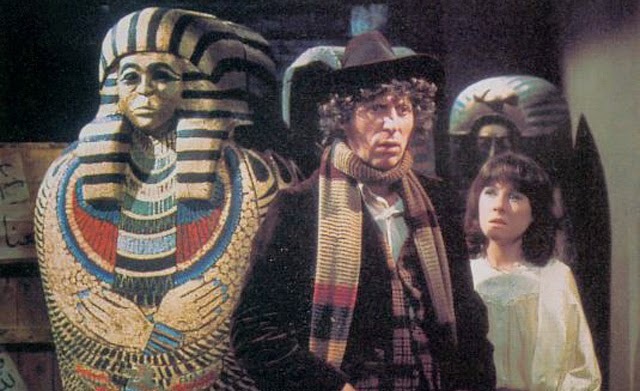 The hulking great bandaged lumps of metal are first shown to be activated in order to hunt down the Doctor, Sarah-Jane Smith & Scarman's former childhood friend Doctor Warlock, controlled via vocal commands and/or a control ring & later put to work on the construction of Sutekh's Osirian war missile-which he hoped to use to destroy the pyramid he'd been trapped in & free himself to lay waste to the world. The missile itself is programmed in line with the alignment of stars & other celestial bodies, which the Egyptians are said to have placed great importance upon. You might also remember stories dating from December 3, 2012 which stated that there would be a planetary alignment of Mercury, Venus & Saturn over the Great Pyramids of Giza? The 1994 book The Orion Mystery, by Robert Vaubal & Adrian Gilbert, went so far as to suggest a link between the location/placement of the Pyramids & the constellation of Orion. SUTEKH: You are a Time Lord. What interest have you in humans? DOCTOR: All sapient lifeforms are our kith, Sutekh. SUTEKH: Horus held that view. I refute it. DOCTOR: Because you fear that other intelligent lifeforms may grow to rival you in power, so you kill all life wherever you find it. The scene is then set for an epic race between two teams of participants- the Doctor & Sarah-Jane and Scarman partnered by a service robot- through Sutekh's prison. A series of logic puzzles must be solved as they progress, but before that the Doctor briefly becomes a servant of the being also known as Set- the TARDIS seized upon as an ideal means of transporting Scarman to the pyramid. SUTEKH : I send you the Time Lord. He will control the machine. The human girl will accompany you. If the Time Lord shows the slightest sign of self-will, kill her immediately. SCARMAN: It is understood, Great One. SCARMAN: Stand back. He is possessed by the Great One. Whom do you serve, Time Lord? SCARMAN: Who holds all life in his hands? SCARMAN: Who is the bringer of death? SCARMAN: Venerate his name and obey him in all things. SCARMAN: Control is established, Great One. SUTEKH : It is well. But the Time Lords are a perfidious species. Dispose of him when you reach the pyramid of Mars. Mercifully for the fate of the universe the mental grip exerted by Sutekh on the jelly baby connoisseur doesn't last too long! DOCTOR: You're soaking my shirt. DOCTOR: Respiratory bypass system. Useful in a tight squeeze. Where are we? SARAH: Er, pyramid of Mars. DOCTOR: Of course. Sutekh sent Scarman here to deactivate the pyramid. Where is he? SARAH: I thought you'd become a zombie like Scarman. DOCTOR: Sutekh didn't need me any more, so he relaxed his grip. HORUS: Intruders, you face the twin guardians of Horus. One is programmed to deceive, the other points truly. The two switches control your fate. Instant freedom or instant death. Before you choose, you can ask one guardian one question. This is the riddle of the Osirans. Which is the guardian of life? DOCTOR: Which indeed. They're both contra-programmed so that one will always give a false indication. One question. If I were to ask your fellow guardian the question, which switch would he indicate? I see. So if you're the true guardian, that must be the death switch. And if you're the automatic liar, you'd be trying to mislead me, so that still must be the death switch. Therefore, this has to be the one we want. "I have won my freedom, Horus. Your curse is lifted. Now begins the reign of Sutekh the Destroyer. I shall crush this miserable world, and hurl it into the outermost depths of space. My vengeance starts here!My paralysis has left me. I can move again. I can move! Now, Horus, we shall see who rules the cosmos!" ...the Doctor is able to trap him, ''caught in the corridor of eternity''. Cosmic!